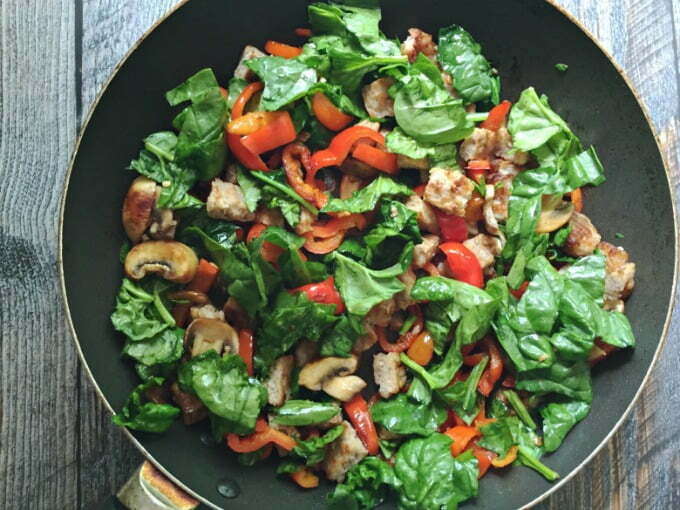 I love peppers and sausage, especially with eggs so I wanted to include those for sure and I thought the spinach and mushrooms would be nice for color and nutrition. I added the baby spinach last and just let it wilt. I wanted it to have more bulk so pictured above is what the veggies looked like when I was finished sautéing them. After the sausage mixture has a cooled a bit, add it to your beaten eggs. I added some cheese for extra flavor and because of its low carb value but if you are watching your calories, you can omit the sausage and cheese and maybe add a little more seasoning or a tiny bit of a sharp tasting cheese like feta or asiago which will give you more bang for your calorie buck. Special note: Make sure not to fill these too high. You want some room at the top because they will rise and expand while baking. And here is the final product. They were even higher when they first came out of the oven but had deflated by the time I got around to photographing them. Regardless, they were delicious and as I write this I am on my second batch because I liked them so much. Hope you do too! 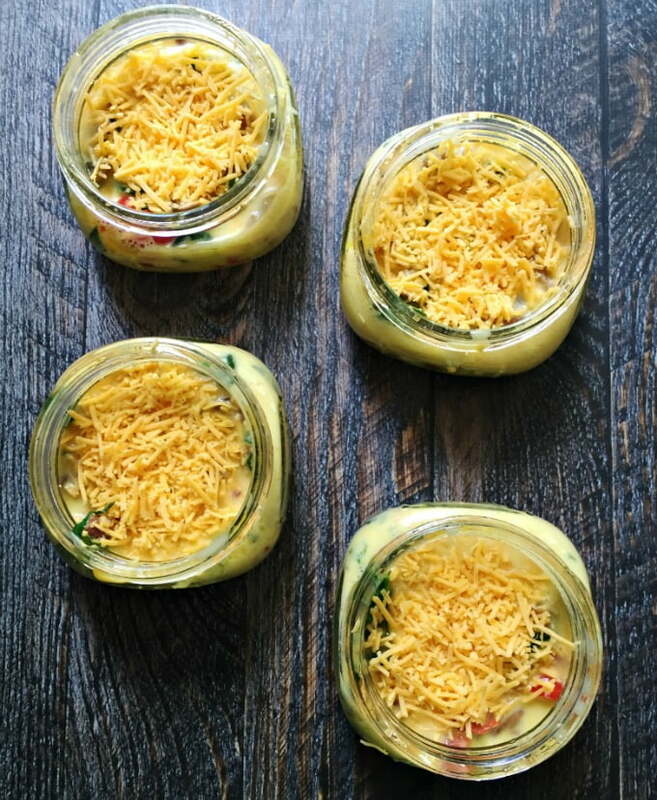 Disclaimer: One reader pointed out that you should not put mason jars in the oven. I was unaware of this when writing the post. And while I had no trouble I understand that the type of glass that mason jars are made of can not withstand large temperature fluctuations which may cause it to break. Here is an article I found that says you can bake in jars if you use a water bath. I have not tried it but I wanted you all to be aware of the risks. Another reader pointed out that these are 1/2 pints. If you are using larger jars, you will have to use more of the mixture and it may take longer to cook. I made these for a work week, five jars on a Sunday night and paired with candied pecans some days and sweet potatoes with brown sugar on other days. I wasn’t sure about leaving just the mixture in the jars in the fridge but baking them and allowing them to cool and then refrigerating worked well and lasted five days. Sooooo good. And I’m the same way with eating breakfast: if it’s not ready, I’ll just skip it and wait for lunch. Lol thanks for this idea ! Hi Whitney, so glad they worked for you! Thanks for stopping by and sharing your tips and ideas. 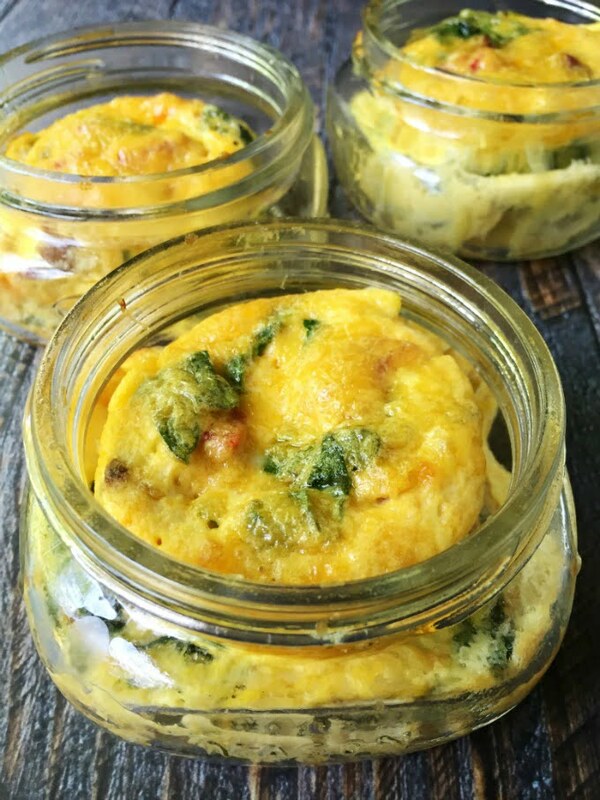 I’ve been eating egg muffins lately because I can freeze them and heat them up in the microwave quickly. However you reminded me that I should make these again. Enjoy the rest of your weekend! I would like to know how long these will last? Do they have to be refrigerated? Wanted to make them for Christmas gifts. Hi Sandra, if you are talking about them being uncooked in the fridge I would say a day or so. Sometimes the eggs separate or get a bit watery. If you are cooking them, I would not do more than a day. Since you are giving them as gifts maybe do a dry run with just one jar? Sausage just a little bit of the veggies and sausage and use an egg or two. I would also suggest using cream instead of yogurt as yogurt has more water in it. Sorry I’m not of more help. About baking with Mason jars: when my son was deployed overseas I joined a group called Proud Army Moms. They taught me how to send my son baked goods in Mason jars! They work very well, they re made to withstand high heat. Fill them 2/3 full with any batter – cake, muffin, quick bread, etc., and bake. When they come out of the oven put the lids on right away. You’ll hear them pop when they seal. I sent over a dozen cases of Mason Jar Cakes to my son and never had a problem with a single one! Oh that’s great to know! Thanks for sharing and helping my readers! I love to eat out of jars and that sounds great what you did for your son. WONDERFUL INFO! Bless and Thank your son for his service – and yours too. Very good! I didn’t have enough half pint jars so used some small Pyrex containers too. No problem baking in either but will probably use Pyrex ones next time due to warning. Thanks! Thank you for letting me know it worked well in the pyrex containers. I’m sure my readers will like to know that too! LOVE THIS IDEA. I AM PREPARING A FRIEND OF MINE, FROZEN READY MADE MEALS FOR A MONTH. THOUGHT I WOULD ADD THE MASON JAR FOODS ON THE MENU. DO YOU HAVE ANY IDEA HOW LONG THIS DISH WOULD LAST IN THE FRIDGE. IM SURE SHE WILL NOT BE ALBLE TO FREEZE IT, BUT WILL INSTRUCT HER TO EAT THE MASON JAR FOODS IN THE FIRST WEEK. THANK YOU FOR THESE WONDERFUL RECIPES. Hi Michelle, I would imagine it would last a few days. You sound like a great friend! Have you tried making these and them baking them in a crock-pot? No I haven’t but I’m intrigued! I bet that would work! Or even a microwave. Personally, I have baked pecan pies in jars that had been frozen. I defrost them overnight in the fridge, making sure they are completely defrosted. Then I place the jars in a metal baking pan in the oven at the time I turn on the oven to 350 degrees. Then I bake them until the crusts are slightly browned (you can see through the jars). If the tops start to get too dark before they are ready to come out, I place foil over the top. I use Ball mason jars. Thanks so much for taking the time to comment! That is great to know and I know it will help me and my readers. Can you freeze these? Before cooking? After cooking? I don’t think you could freeze these. You might have a problem with jars going from cold to hot and therefore cracking the glass. Also eggs don’t always taste as well frozen. That’s just my thoughts. I have never done it. Hope that helps! See my comment about DEFROSTING the jars. So good!! I dont have an oven, so I tried the Poach approach. Worked like a charm. Small amount of water in a med pot and placed jars in low boil water, then i poured in the mix and 15 mins….. beautiful and delish! I left in water until cool to touch. THANK YOU !! Thanks for sharing! Maybe this will be of help to someone else and I’m so glad you liked it! Where can I get these mason jars? They seem different from the average store purchase. They are 1/2 pint jars. You can buy them on Amazon. I have a link right above the recipe. I think I got mine at Target though so maybe you can find them there? I find cases of mason jars at Walmart, but also most of the local grocery stores carry a small selection as well. Hi Kathy, I had no problem baking these in the oven as described in the directions. However I have just read that Ball does not recommend using them in the oven because they are not made of oven safe tempered glass. I believe they can crack from a sudden temperature change. 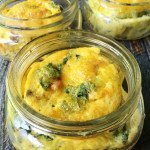 Here is an article I found that describes how you can use a mason jar as a baking vessel if that helps. They recommend baking them in a water bath. I hope that helps. you are serving them to people you may not like the consistency. Hope that helps! How long would these last in the frig? something I could eat for break, lunch or dinner. Please let me know if you have any other questions. How are these reheated? I want to make up about 25 of these to take for a ladies retreat. Would it be easier to make there or to pre-bake and reheat? 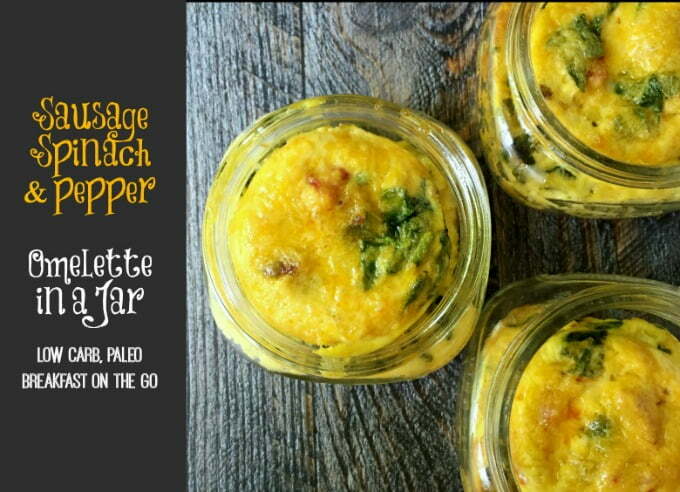 I would need to make these on Thursday morning for reheating Saturday. Since you are making these for an event, I would suggest making the “batter” ahead of time. Then mix the batter well, pour into your jars and cook there if you can. I think reheating the eggs sometimes makes it tougher. It’s fine for me for breakfast but since you are making these to serve others it would probably be better to bake that day. Hope that helps. Please let me know if you have any other questions. I believe you may have used 1/2 pint jars. I just tried this with pint size and there is not near enough to fill them. Even your pictures look like 1/2 pint jars. Yes they are 1/2 pint size jars. I will add that to the recipe so others will know. Thanks for bringing that to my attention! I used pint size jars. You could use larger ones, but you’d have to double the recipe. They also worked welled in a larger ramekin but I like the pint mason jars because of the lids. Hope that helps! Looks good. Do you eat them cold or reheat somehow? I reheat them in the microwave. Just take off the metal lid and heat for 30 sec. to 1 minute depending on your microwave. Thank you! I’ve tweeted and g+ the party. Very unique, I will pin this to try later! Hope you do and hope you like it! I love the to-go part. My husband has to leave for work at 6 am. He doesn’t want breakfast that early, so he takes something with him to eat at his office. These would be perfect for him. Thanks for sharing. I’m not a big breakfast person so I have to make things “to go” or I will just skip it. Hope he likes them!